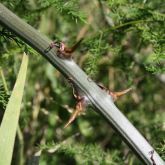 Native to southern Africa, climbing asparagus fern is a garden plant that causes serious environmental problems when it escapes into bushland. Climbing asparagus fern easily scrambles over other vegetation up to 12m into the canopy! A. africanus has spikes along the stems and is an aggressive weed of urban bushland in tropical and subtropical areas. The leaves are fine, feathery with leaf-like cladodes arranged in horizontal sprays with a ferny appearance. The flowers are small, A plumosus has greenish white and single or in pairs arranged at the tips of branches, in spring to autumn. 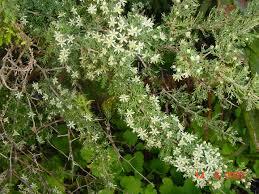 A. africanus flowers are cream-white and occur in clusters from September to November. The fruit are fleshy, A. africanus berries turn orange when mature with a single seed. A. plumosus have blue-green berries at first, ripening to black 4-5mm wide. The roots are a tough woody crown with extensive fleshy root mass radiating out and a exceedingly difficult to pull out. Seeds are dispersed by birds and water. Rhizomes and fruit containing seeds also spread in dumped garden waste. Remove and dispose of all aerial stems from the site as they can re-establish into new plants. The crown of the plant should also be removed and all berries collected. Hand pull emerging seedlings, dig out root systems. Foliar spray metsulfuron-methyl at 1g per 10 litres with surfactant if you wish to use a spray.